A costly necklace of ports? The Rs 8 trillion Sagarmala project comes with huge promise. But are we prepared for the social and economic costs? In the sultry May of 2015, union minister of road transport and shipping Nitin Gadkari was meeting officials at Parivahan Bhavan, a stone’s throw from parliament. They were discussing Sagarmala, an initiative that is humungous and hugely ambitious: over 400 port-related projects along the over 7,500 km coastline of the country, a time span of 20 years, and an estimated expense of Rs 8 lakh-crore (or eight trillion rupees), which is more than a third of India’s 2017 budget. As the name indicates, it envisages a garland of ports and SEZs that will make logistics easier for manufacturers and exporters. It’s also a pet project of prime minister Narendra Modi, who spoke of the project ushering in a maritime ‘blue revolution’ harking to an age when Indian ports and merchant ships invigorated trade with Africa, the Arabian Gulf, Iraq and Persia to the west and southeast Asian countries like Burma, Thailand and Cambodia and as far as Indonesia to the east. But projects do not run on enthusiasm alone. So management consultancy McKinsey and American engineering firm AECOM were hired to prepare a national perspective plan (NPP) – essentially a roadmap – for the multibillion-dollar project, which received cabinet approval on March 25, 2015. The two firms submitted their plans within six months. The ministry of shipping set up the Sagarmala Development Company in 2016 as a nodal agency to oversee implementation. Two years since cabinet approval, while a gung-ho spirit enlivens the departments and officials involved, there are questions about how Sagarmala is stringing along and whether adequate groundwork has been done to ensure its viability. According to highly placed sources, of the 438 projects under Sagarmala, 239 are at various stages of implementation and development; 199 are to be taken up by 2020. And in the initial stages, the focus is on five states – Gujarat, Maharashtra, Tamil Nadu, Andhra Pradesh and Odisha. In fact, nothing much has happened on the ground: this is because only Gujarat and Andhra Pradesh have been able to confirm availability of land. Sagarmala envisages coastal economic zones (CEZs), considered to be the brainchild of Niti Aayog deputy chairman Arvind Panagariya (who resigned recently). Analogous to the special economic zones (SEZs), which were much talked about in the 1990s and early 2000s but never really took off, CEZs will be districts with strong linkage to ports, industrial corridors, dedicated freight corridors and multiple coastal economic units (CEUs), housing industrial clusters and other projects. It is hoped that governments will offer incentives to attract investors to set up manufacturing units. The creation of the ports and CEZs – which form the core of Sagarmala – will involve an investment of Rs 8 lakh crore over 20 years, as the minister of state for shipping and road transport and highways Mansukh Mandaviya told the Rajya Sabha on July 18. But government officials believe this won’t be a problem as Sagarmala is based on a PPP approach. “Those interested in investing in ports will be allowed to operate them so that they could recover their money. Also, our ports are rich in terms of resources. Therefore, it is not a big problem for us,” says a senior government official. This sounds plausible. Twelve major ports – Paradip, Kandla, Mumbai, Jawaharlal Nehru Port Trust (in Navi Mumbai), Marmugao, New Mangalore, Kochi, Chennai, Ennore, Tuticorin, Visakhapatnam and Kolkata (including Haldia) – have posted profits of about Rs 5,000 crore in 2016-17. If part of their annual profits, running in this range, is leveraged into the Sagarmala initiative over the next 25 years, it could easily generate a trillion rupees. Land acquisition, however, will be a major problem. So will be environmental clearance for units that will come up near the coast. “There are several challenges – from environment clearance to land acquisition to connectivity (by rail and road),” a senior official said. The 14 CEZs to be developed in Gujarat, Maharashtra, Goa, Kerala, Karnataka, Tamil Nadu, Andhra Pradesh, Odisha and West Bengal would require huge tracts of land. The McKinsey-AECOM roadmap said each CEZ would be along 300-400 km of coastline. This could put fragile ecosystems at risk, besides requiring huge displacements of local people, causing resentment. “You’d realise that it’s not possible to get such huge tracts of land in India, especially tracts where there’s little or no habitation,” says a senior official of a private firm hired to assist the Sagarmala Development Company in implementing projects. He says that the ministry of shipping has had to decide that CEZs would have to come up on smaller tracts than envisaged in the national perspective plant; also, that they would have to be developed in phases. 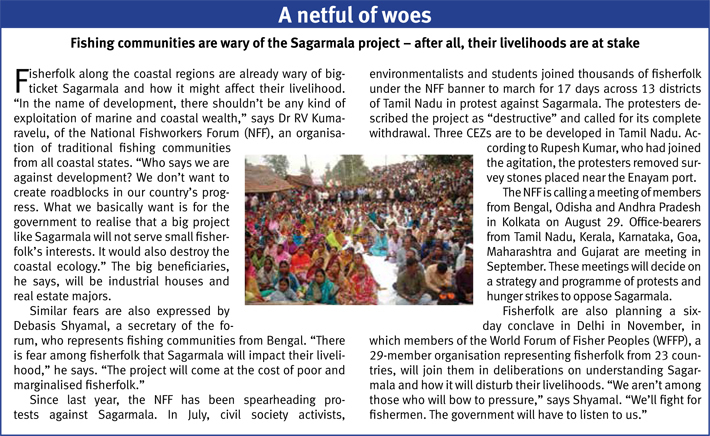 The project is obviously too big to execute in one go, especially since land acquisition is bound to pose a hurdle. Five states – Gujarat, Maharashtra, Tamil Nadu, Andhra Pradesh and Odisha – have given positive signals on land acquisition. Gujarat and Andhra Pradesh have actually confirmed land availability; others say they are in the process of acquiring land. Therefore, in the initial months, implementation would be in these states. Work will start only after a detailed master plan is prepared. Andhra Pradesh, where two CEZs – the Vizag-Chennai Industrial Corridor (VCIC) Central and VCIC North – are proposed has already awarded contracts to a firm for developing a master plan for these two CEZs. In Gujarat, tenders have been invited for selecting firms that will prepare a master plan for proposed CEZs in the Kutch district, Suryapur (or Surat), and the Saurashtra region. According to sources, the other states are expected to intimate the ministry soon. Once the 14 CEZs are up, they will result in 29 port-linked industrial clusters: two for refineries and petrochemicals; four for gas-based petrochemicals; three for power plants; two for steel; two for marine products; two for cement; two for food-processing; two for science and technology; three for apparel; one for automotives; three for leather and footwear; and three for furniture. The Kutch CEZ, for example, to be developed around the Kandla and Mundra ports, will have industrial clusters related to petrochemicals, cement and furniture. The Kalinga CEZ, near the Paradip and Dhamra ports, will have clusters related to petrochemicals, besides marine food processing units spread in districts like Puri, Jagatsingpur, Cuttack, Kendrapara, Jajapur and Bhadrak. The Gaud CEZ in West Bengal will have leather-processing units. The idea is to make these manufacturing units competitive in the international market by having them spend less on transportation to ports. But all this will involve total investments of an estimated Rs 85,000 crore to Rs 90,000 crore by business and industry – which can happen only if the incentives offered are attractive enough and the proclaimed advantages translate into reality. Raising a skilled workforce – both, for executing the CEZs and for employ in the industrial units that are to come up – may also prove difficult. A PricewaterhouseCoopers report has identified skills gaps in the districts around which the CEZs are coming up. To remedy this, the government plans to train over one million youths in the coastal districts in trades related to manufacturing, logistics, fisheries and tourism. In the first phase, 21 districts are to be covered, and the rest will be covered in the second phase. But no one is sure when the training programmes that will prepare the youths for employment, and bring about a major economic transformation of those regions, will begin. Jobs and GDP are the two major areas in which the Sagarmala initiative is expected to be a game-changer. The national perspective plan claims that the industrial clusters could generate 40 lakh direct and 60 lakh indirect jobs – one crore jobs in all. 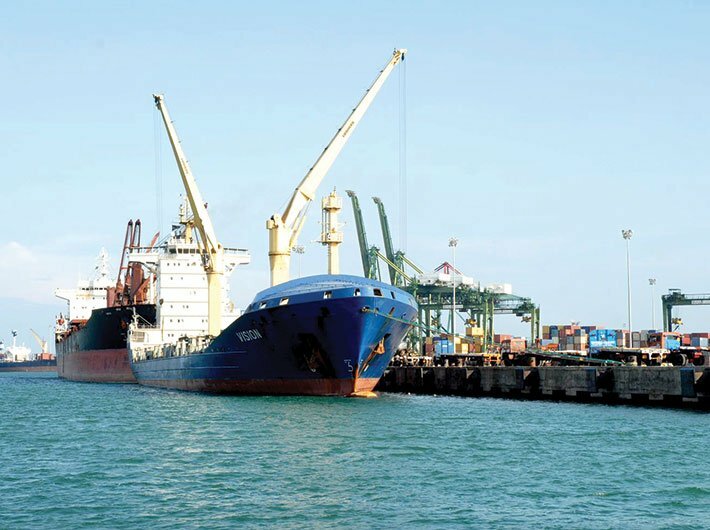 A study by the multinational Ocean Group, which has diverse interests, speaks of the Sagarmala project adding two percent to the country’s GDP. NITI Aayog CEO Amitabh Kant says that if India is to accelerate its growth rate, already between seven and eight percent, the only way is to penetrate the global market – and only ports can drive that growth. Huge savings, too, are projected: the government hopes that the nation will save Rs 35,000 crore to Rs 40,000 crore just on logistics costs. Indeed, expectations are running extremely high. Long-term planning – not particularly a strength of governments – is key to Sagarmala’s success. Besides, since the project will only take off in phases over two decades, business and industry will have to look through predictive telescopes to retain relevance in the long term, given the turbulence in global economics and geopolitics. There are also advances in technology – automation, for instance – to watch out for, as these could render skilling intiatives fruitless. In an age in which agile and shape-changing plans succeed, this slow-moving mammoth, with all its associated environmental and livelihood-affecting risks, is a major gamble. It will take the government and its many departments involved a lot of careful and flexible planning to bring Sagarmala to fruition.